We do not assume liability for the timely processing of messages or instructions forwarded to our office by e-mail. This is particularly applicable for the observation of deadlines. The risk for e-mail communication shall be borne by the sender. Please contact our attorneys in person. Note: You can revoke your consent at any time for the future by e-mail to kanzlei@rae-weyrich.de. 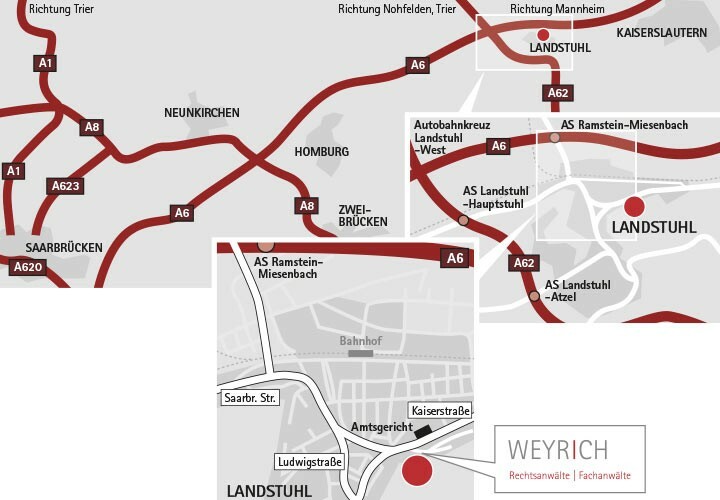 Our office is located in the centre of Landstuhl, opposite the Municipal Court, in close proximity to a number of authorities (city hall, fiscal authorities). Sufficient parking space is provided for our clients. Leave the A6 at exit Landstuhl Ost / Ramstein - Miesenbach Air Base, turn right at the end of the exit (1st set of traffic lights) and follow the road, direction Landstuhl, crossing a second set of traffic lights. Turn left into Kaiserstraße, direction city centre (Innenstadt) at the third set of traffic lights and follow the road, direction Kindsbach / Kaiserslautern. To your left you will pass the community hall and the town hall. After approx. 150 m, turn into Friedhofstraße, opposite the municipal court. 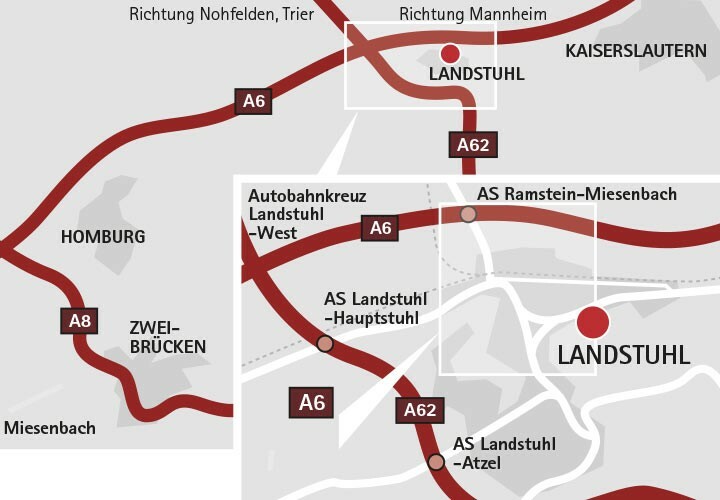 Leave the A6 at exit Landstuhl Ost / Ramstein - Miesenbach Air Base and turn left at the end of the exit (1st set of traffic lights). Turn left into Kaiserstraße, direction city centre (Innenstadt) at the second set of traffic lights and follow the road, direction Kindsbach / Kaiserslautern.